Data, once collected, often has to be transferred over a large distance. Large and medium-sized companies can often use their own company network for this purpose. However, many readers only have a standard interface and cannot be integrated into the network. 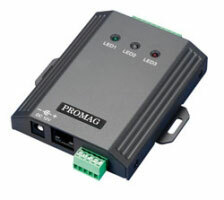 The WEC-200 converts data packets of various data collection devices with Wiegand interface into an Ethernet compatible format. It supports Wiegand formats with 26, 30, 34, 35, 37, 38 and 42 bit. This allows long-range data transfer over the company network of you offices and production facilities. With devices such as the Promag access control unit SF-500/-600 or RFID readers of the GP series, the converter takes the data packet with the serial number of the accessed tag and transfers it over TCP/UDP.